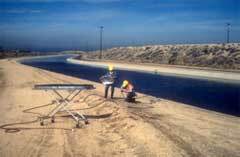 WATER TAKEN FROM "LESS VALUED LANDSCAPES" IS IMPORTED THROUGH 400 MILES OF AQUEDUCTS TO THE LOS ANGELES AREA. 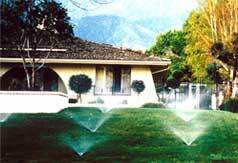 IN THE ARID WEST 60% OF URBAN WATER IS USED TO WATER LAWNS. THIS PROJECT QUESTIONS OUR INSISTENCE ON MAINTAINING THICK, SEDUCTIVE, HEAVILY WATERED GRASS LAWNS AS CENTRAL TO THE IDEAL LANDSCAPE. ONCE A SYMBOL OF PRESTIGE AND EXCLUSIVITY, LAWNS ARE NOW A COMPULSORY LANDSCAPE ELEMENT TO ANY SUBURBAN OR CORPORATE IMAGE. BENEATH THE SEAMLESS GREEN CARPETS, HOWEVER, LIE SIGNIFICANT AND SERIOUS ECONOMIC, ENVIRONMENTAL AND SOCIAL COSTS. REGULAR CHEMICAL PRESCRIPTIONS ARE REQUIRED TO KEEP A LAWN LOOKING GREEN AND PERFECT. 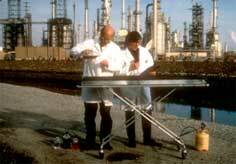 THESE CHEMICALS ULTIMATELY ENTER THE GROUND WATER OR FLOW TO RIVERS AND THE OCEAN. LANDSCAPING WITH DROUGHT-TOLERANT AND NATIVE PLANTS LESSENS OUR DEPENDENCE ON FOSSIL FUEL ENERGY AND APPLIED CHEMICALS,ULTIMATELY REDUCING CONTAMINATION OF ECOSYSTEMS AND GROUND WATER. NATIVE PLANTS ESTABLISH A LOCAL SENSE OF PLACE WHILE ATTRACTING AND PROVIDING FOOD AND SHELTER FOR WILDLIFE. LAWN CARE IS A 25 BILLION DOLLAR A YEAR INDUSTRY IN THE USA. 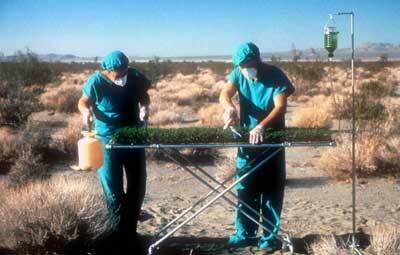 67 MILLION POUNDS OF PESTICIDES WERE SOLD FOR USE ON AMERICAN LAWNS IN 1988. 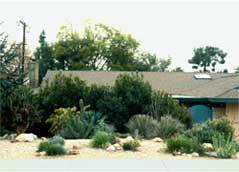 REPLACING THE LAWN WITH PLANTS NATIVE TO THE REGION IS A FAR MORE EFFICIENT USE OF WATER. THIS PROJECT WAS FIRST EXHIBITED AS AN INSTALLATION TITLED “LAWNS IN THE DESERT” AT THE LOS ANGELES MUNICIPAL GALLERY IN 1995.